The Hyundai Accent is one of the few subcompact that is selling better than it did last year, and that's quite an achievement. So what does Hyundai have up its sleeve for 2010? There have been a few updates, the most notable being the new "Blue" model. This model will start at $9,970 and has transmission tweaks and a lower ride height. This helps the Blue get mileage ratings of 28 city, 36 highway. Other Accents get 28/34 with manual, 27/36 with the automatic. Other updates will include the availability of USB and iPod connectivity on all audio-equipped models, and steering wheel audio controls on Accent SE (optional on GLS). There are also blue-backlit gauges, available ABS on the GS, and standard cruise control and sunroof on the SE model. Power will continue to be a 1.6-liter engine making 110 hp and 106 ft./lbs. of torque. Five-speed models will get a shift light telling drivers when to shift for optimal fuel economy. Plus, there will be an "ECO" light telling drivers when optimum fuel economy is being achieved. Prices will range from the above-mentioned $9,970 for the Blue and $16,995 for the top-of-the-line SE three-door hatchback. The Accent continues to improve, and a new version is due in 2011. The warranty, price and the reliability are enough to keep sales up, but the little extras Hyundai is adding sweeten the deal. ... and the sales are showing, too. 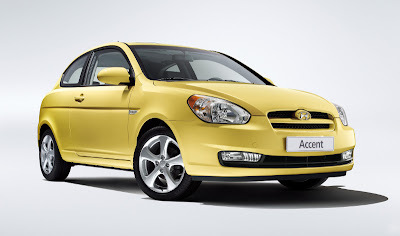 Hyundai has hit its stride with the Accent, and I look forward to seeing what they have on tap for '11. All it needs now is a five-door.